U. WASH (US)—A recent phone survey of more than 1,000 people in seven states shows that whites who are strong supporters of the Tea Party movement are apparently less committed to freedom and equality than those who oppose or are unenthusiastic about the movement. “Our survey suggests that among Tea Partiers, there’s less dedication to certain civil liberties,” says Christopher Parker, a University of Washington assistant professor of political science who leads the 2010 Multi-State Survey of Race & Politics. It examines what Americans, including supporters of the Tea Party, think about race, public policy, national politics, and President Barack Obama. Among whites who strongly support the Tea Party, 60 percent agreed that America “has gone too far in pushing equal rights.” By comparison, only 23 percent of white Tea Party opponents agreed with that statement. 94 percent of Tea Party opponents said American society “should do whatever is necessary to ensure equal opportunity.” Of all whites polled for the survey, 79 percent agreed with that statement. 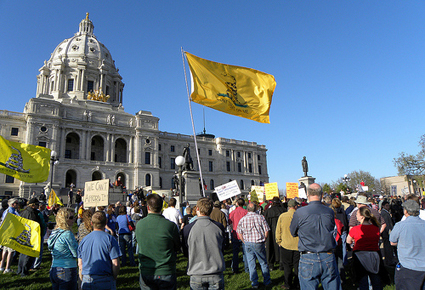 Tea Party supporters agreed less. Sixty-four percent said America should do whatever’s necessary. 72 percent of Tea Party opponents concurred that “we don’t give everyone an equal chance in this country.” By comparison, 55 percent of all whites and 23 percent of strong tea party supporters concurred with that idea. 77 percent of Tea Party opponents agreed that “if people were treated more equally, we’d have many fewer problems in this country.” By comparison, 54 percent of all whites and 31 percent of Tea Party supporters agreed. 90 percent of Tea Party opponents dissented from the idea that the “government can detain people as long as it wishes without trial.” By comparison, 70 percent of all whites and 54 percent of Tea Party supporters dissented. 72 percent of Tea Party opponents disagreed that the government should be able to tap people’s telephones. By comparison, 50 percent of all whites and 33 percent of Tea Party supporters held that position. 94 percent of Tea Party opponents agreed that “no matter what a person’s political beliefs, he or she is entitled to the same rights as everyone else.” By comparison, 89 percent of all whites and 81 percent of Tea Party supporters agreed. 74 percent of Tea Party opponents dissented from the idea that “the government should be allowed to profile someone because of race or religion.” By comparison, 57 percent of all whites and 33 percent of Tea Party supporters opposed such moves. “Paradoxically, Tea Party supporters talk about freedom from government but as the data suggests, many strongly support certain government activities that could limit freedom,” Parker says. The survey also drew opinions about President Barack Obama: 79 percent of Tea Party opponents said Obama is knowledgeable, 74 percent said he’s intelligent, 86 percent said he’s moral and 79 percent said he’s a strong leader. Among all whites, 60 percent said Obama is knowledgeable, 63 percent said he’s intelligent, 61 percent said he’s moral and 64 percent said he’s a strong leader. Tea Party supporters were less approving than both of those groups: 38 percent said Obama is knowledgeable, 37 percent said he’s intelligent, 32 percent said he’s moral, and 44 percent said he’s a strong leader. The poll reached 1,006 people in seven states. Six of them—Georgia, Michigan, Missouri, Nevada, North Carolina, and Ohio—were battleground states in the 2008 presidential election. The seventh, California, was included to represent the West Coast. The UW Center for Survey Research conducted the survey by phone from Feb. 8 to March 15. The sampling error margin is plus or minus 3.1 percentage points. The Washington Institute for the Study of Ethnicity, Race and Sexuality and the UW Department of Political Science paid for the survey.